Linked below are some of my thoughts as we head into year end and people start looking for opportunities to take advantage of in 2015. I’ll be updating this list over the next couple weeks as I complete analysis and as I see things develop. *Just a note. These are the types of setups my process looks for. Sometimes I wait days, weeks, months, or even years for these types of factors to come together and create a trading opportunity. These specific trades may or may not work, but the risk/reward potential is so good that I’d gladly lose money getting stopped out on any of these setups. At the end of the day it’s not about being right, it’s about making money. As long as I’m taking the setups that fit my process and I’m disciplined in my entries and exits, I’m happy, win or lose. So without further adiue, ideas listed below. Given the mean reversion we’ve seen in the grains over the past few weeks, I think that based on the current conditions in energy we could see something similar occur as we head into next year. There are two very important factors in this space that apply to Crude, Gasoline and Heating Oil. I’ll outline those below and then go through the setups individually. 1. There is extreme bearish sentiment in the energy space at this point in time. Crude oil sentiment is testing roughly 2 year lows and hedgers are slowly unwinding their positions. Gasoline sentiment is at 12 year lows with the amount of commercial hedging testing last years lows. Heating oil sentiment is at 12 year lows with the amount of commercial hedging testing lows not seen since last year and before that, 2005. 2. Prices are so far extended from their 200 period moving averages in all of these commodities. I’ll outline them individually, but to provide some perspective, Gasoline futures are currently 33% below their 200 week simple moving average. This is something that, in my opinion, is not sustainable over the long term. Now that we have some perspective on sentiment and the possibility of mean reversion, let’s see what price is telling us. From a structural perspective, Crude oil is a mess after it broke down from a 4 year symmetrical triangle and is reaching the most oversold it’s been since ’09. Given where sentiment is, we can’t be short and are leaning more neutral/bullish. 1. Prices 23% below a falling 200 week. 2. Prices finding support at 3 year support level near 76. 3. Long wick on the weekly candle (needs follow through). Taking a look at seasonality and sentiment in the Euro, I think that a pretty nice backdrop for a squeeze is setting up here. Seasonally, November and December are two of strongest months for the Euro. Additionally, with both sentiment and commercial hedging at two year lows the public seems to think that the Euro will head lower while the “Smart Money” hedgers think it’s heading higher. With a strong backdrop provided by seasonality and sentiment, let’s take a look at price action. 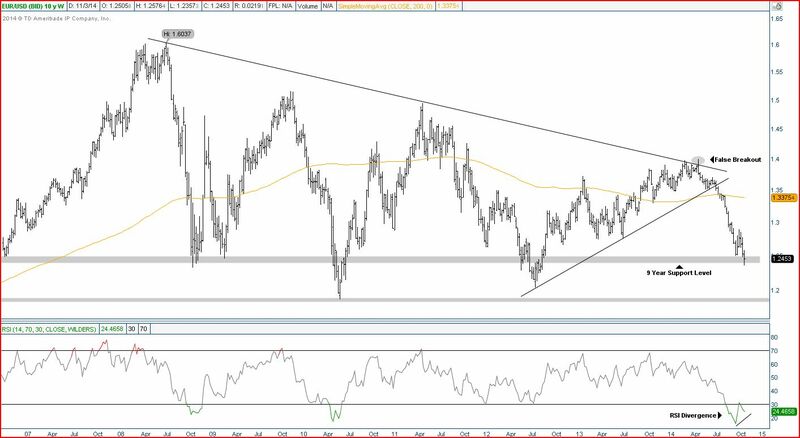 Structurally EUR/USD has been a mess since its false breakout in April, but given sentiment and the factors listed below, a more neutral outlook is probably best as we approach support. 1. Breakdown out of long term symmetrical triangle. 2. Long bottoming tail at 9 year support level (needs follow through). 3. Positive momentum divergence developing. 4. Flat 200 week sets up the possibility of mean reversion. With sentiment in the metals at extremes, and rightfully so, there is quite the potential for a squeeze to occur in these areas of the market. Structurally the best metal in the game remains Palladium, but from a tactical perspective I think that there is a huge potential for a move to the upside in both Gold and Platinum over the intermediate term. First off, I want put sentiment in perspective for both of these metals. 1. Gold sentiment nearing YTD lows. 2. Gold hedging nearing YTD lows. 3. Platinum sentiment at 12 year lows. 4. Platinum hedging at 2 year lows. Sentiment has been a trainwreck for most of these metals but price has not been able to get going enough to ignite a short covering rally of any significant magnitude. I think with the action we’re seeing in price is signaling that this time may be a bit different. 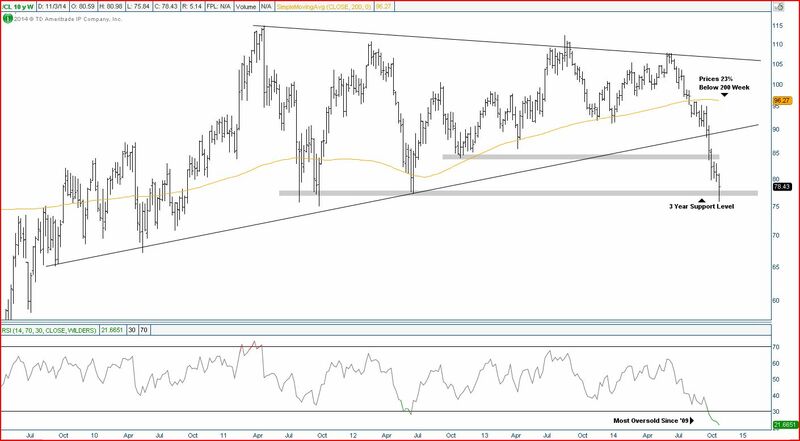 After an extensive run thus far in 2014, I believe that the risk/reward in the Dollar Index, at least from a tactical perspective, favors the short side. The first thing I want to look at is sentiment as unwinds in extreme optimism or pessimism can be a very strong catalyst in driving any market. Well since sentiment is telling us to lean neutral/bearish, let’s see what price is telling us.